Although Mr Parnell RIP was acquitted in January 2010, the corrupt LibDem council at Stockport kept hounding him even until his death. 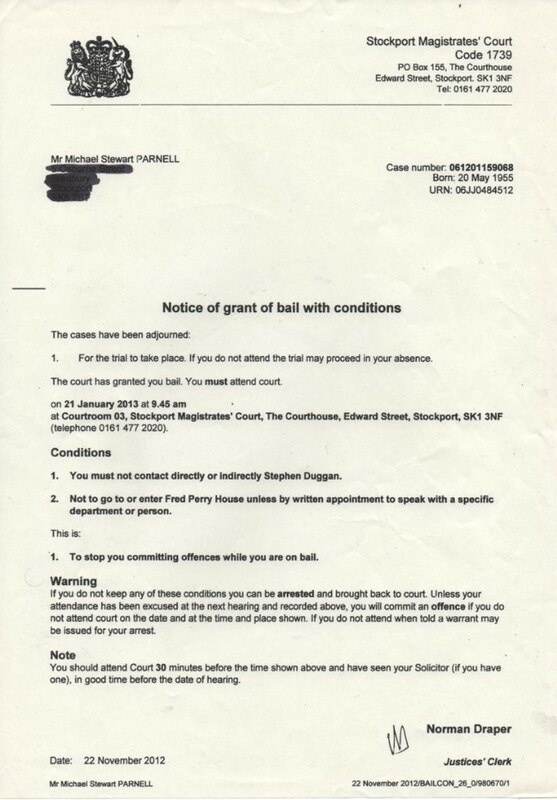 In the court document below, he is still on bail and not allowed to enter Fred Perry House in January 2013, even though council employees were found to have perjured themselves in court and Mr Parnell had been acquitted of any offence. The police have admitted he was completely innocent. Barry Khan, then Council Solicitor and Monitoring Officer, was fully aware of the true state of affairs, as was Mr Parnell's MP - Andrew Stunell, and Greater Manchester Chief Constable Peter Fahy. These people conspired to hound an innocent man to his death. They were paid to help and protect him.